The creation of a wildlife habitat was a principle consideration during the planning and construction of Widow’s Walk Golf Course. A links-type course built built on the site of an abandoned gravel quarry adjacent to the scenic North River Basin and within view of the Atlantic Ocean, Widow’s Walk is home to a multitude of waterfowl and migratory and indigenous birds. However, many years of mining in the area destroyed most of the native plant communities which created a significant challenge to the making of "America’s first environmental demonstration project". Designed by renowned environmental architect Mike Hurdzan, Widow’s Walk was designed to utilize and enhance the site’s natural resources, special plant and animal communities, and wetlands. While most golf courses are created by cutting down trees, Widow’s Walk’s design was considerate of the area’s uncommon habitat. The plant communities and elevational changes at Widow’s Walk is so great that it attracts a great number of migratory birds. 73 species were found here this summer by observers from the Massachusetts Audubon Society. From the outset, David Clapp, Director of the Massachusetts Audubon Society’s South Shore Regional Office, was actively involved in the design of the course and the ensuing natural history efforts. Clyde Gurney, a Scituate resident and long-standing birder, contributed greatly to a joint effort aimed at establishing a more receptive and supporting environment for bird life at Widow’s Walk. Why? Why make such a big deal out of birds and other wildlife when the purpose of a golf course, by definition, is just a place to play golf? The most obvious answer, responds Audubon’s Clapp is that birds are an environmentally sound way of lowering the insect population, which benefits everyone in the area, especially golfers using the course. In addition, the development of a bird-friendly course provides nesting and roosting opportunities for many cavity-nesting birds. Further, according to Mr. Clapp, an environmentally friendly golf course should include birds as part of its environmental operation. It is part of the "environmental project that is the very essence of Widow’s Walk," says Mr. Clapp, "This course tries to demonstrate a holistic approach to the environment." To which Mr. Gurney added, "Besides it’s a good thing to do!" One of the most visible tacks taken by Messrs. Clapp and Gurney was to construct and erect a substantial number of "bird boxes" on the course to replace the natural "bird cavities" that were destroyed by the earlier mining operation. These boxes house large populations of Tree swallows and Eastern Bluebirds. Interested in nature and birds as a youngster, Clyde did a lot of reading about birds while growing up in Rockland and built his first bird house when he was just 15 years old. He was later a Boy Scout counselor, supervising the young scouts working towards their nature badges. He began quest to utilize golf courses to support bird life in the area in 1940 at the Marshfield Country Club, where he worked to establish purple martin colony. The Purple Martin is a large swallow (the largest in fact) that eats only flying insects, which makes it a darling of both man and the environment. Purple Martins arrive here from Brazil (having made several stops along the way} in early April. They live in "colonies", where they procreate and then prepare for their return trip to Brazil in August. When the Pilgrims arrived in Plymouth in 1620 they discovered the Indians had gourds with holes in them hung on trees around their campsites. The early settlers soon learned what the Indians knew, that Purple Martins are drawn to the gourds where they build their nests and establish a colony. Clyde used special Purple Martin houses constructed of aluminum to establish his first "colony" at Marshfield. It proved successful so he subsequently replicated his efforts at the Halifax Country Club, where he also put up Purple Martin houses and developed another colony. He has since turned his attention to Widow’s Walk, where he has put up nearly 100 bird boxes around the course during the past three years, far enough away from fairways and greens to avoid creating unwanted obstructions for the golfers, while hoping to keep the houses themselves out of harms way. (One house was split by an errant drive, but it didn’t deter a swallow from building its nest in it). All of the houses have been built by Clyde in a machinery shop in Rockland, where he still works a full-time job, bellying his 84+ years on this planet. We are starting to draw Purple Martins here but as yet haven’t established a colony. There has been a problem with House Sparrows, which according to David Clapp, are ‘alien birds’ non-native to the area and hostile to the Purple Martins and other cavity nesters. There is a need to put "door stops" in the Purple Martin houses after the birds depart the area for the winter to prevent the House Sparrows from occupying the houses. The House Sparrows can fill the nesting holes with grasses and prevent the houses from being used by martins the next season. Unlike other summer homes in Scituate, Purple Martin houses are not available for "winter rentals." The Purple Martin population has remained stable over the past couple decades. There are currently about 100 pair at Marshfield, Halifax, Widows Walk and the Audubon Society’s North River Wildlife Sanctuary in Marshfield. These birds represent roughly one-third of the Purple Martins in the state. On the other hand the Bluebird population in this area is showing a marked increase, according to Mr. Clapp. Bluebirds are also insect eaters and quite welcome on golf courses. Eastern Bluebirds used to be so rare in this area that when Clyde had a pair of them at his home in Middleboro in 1960, the Boston Globe sent out a photographer to take pictures, and then ran the pix in the Globe rotogravure section. There were 30 pair of tree swallows and three pair of blue birds, both excellent insect eaters, at Widow’s Walk here this past summer. Mr. Gurney has put up 50 new bird boxes for bluebirds at Widow’s Walk this past year, as well as a number artificial gourds made of plastic that are hung from telephone poles. The artificial gourds attract purple martins much as they did for the Indians many years ago. The artificial houses work even better, however, because they are not as susceptible to weather damage and can be opened and cleaned out after each migratory season. Neither House Sparrows not European Starlings (another alien and invasive species) seem to use the gourds for nesting. Resident "Birder" Clyde Gurney (left) of Scituate and Audubon volunteer Dan Furbish of Marshfield look on as Taylor Price (atop the ladder) of Scituate secures a Common Flicker nesting box in a tree adjacent to the second green. Mr. Gurney relies on volunteers to help install and maintain the many bird boxes that are located at Widow's Walk. 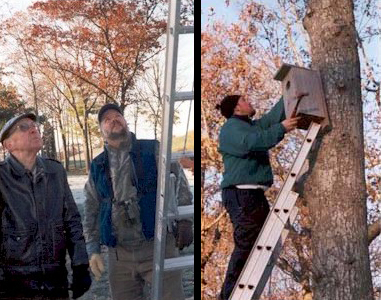 In November Clyde, assisted by Audubon volunteers, put up five Common Flicker houses (a large woodpecker) and four Screech Owl houses around the course. There is also a plan to put up a recently constructed Osprey (fish hawk) platform atop of a 30’ telephone pole that will be erected across the Driftway in the North River marsh. Clyde intends to add more bird boxes in the future, although there is a point where you can saturate an area with too many houses. Bird populations can only support so many boxes and will leave empty houses that are grouped too close together. How many boxes are too many? He doesn’t know exactly, but will experiment until he finds the right combination. An errant golf shot cracked this nesting box, but it failed to deter a mother sparrow from building her nest and laying her eggs in it. Every effort is made to keep the boxes out of harms way, but even the best laid plans sometimes run a stray. #1 The slope to the left side of the 1st fairway grades up to the capped landfill and provides nesting habitat for tree swallows, one of the several species of swallows you will see at Widow’s Walk. The houses on posts along the slope are nesting boxes provided for these insect-eating birds. The coarse vegetation on the hillside offers shelter and seeds to migrating sparrows in the late summer. #2 Large oaks of several species frame the 2nd hole. This is an area where gray squirrels, Blue Jays, and American Crows might easily be seen. The acorns provide food for all three of these species in the late summer and fall. Blue Jays will carry acorns as far as three miles from this site, burying them for later use as food, but many will be lost or forgotten and will eventually become oak trees as part of the natural cycle of forest regeneration. #3 Along the left side of the 3rd fairway, in some tupelo trees, there is a wooden box that has been provided for use by either Common Flickers, a large ground-feeding woodpecker, or by Eastern Screech Owls, one of our common smaller owls. 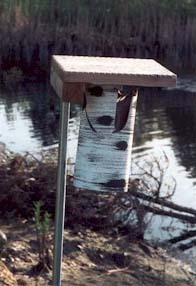 Throughout the course there are boxes for cavity-nesting birds to use. Some are designed for Wood Ducks. The smaller ones are for Eastern Bluebirds and Tree Swallows. #4 The large ash tree, which stands on the left side of the 4th fairway, provides an unwanted obstruction for golfers but a welcome perching spot for two fly-catching birds that commonly nest here, the Eastern Kingbird and the Great-crested Flycatcher. #5 Sumacs and coarse weeds growing in the area near the 5th tee provide nesting sites for some field birds. This is an area where the Eastern Towhee and Field Sparrow are commonly found. #6 The bird houses along the 6th fairway, that look like pieces of birch trees on a pole (are actually made out of plastic PCB pipe) entice chickadees and Tufted Titmice that naturally nest in excacations in old birch trees. #8 The 8th tee almost always offers wildlife sightings. The pond below usually has ducks, gulls and Canada Geese on or around it. The most commonly seen species are mallard ducks and herring or great black-backed gulls. Grewen-wingled Teal, American Coot, and Ring-billed Gulls also visit the pond. #9 The 9th tee provides one more panorama of the North River Basin, showing salt marshes, upland oak forests, the sand hills of North Marshfield and the contours created by the gravel mining here at the golf course. From this vista you may observe, depending on the time of the year, swallows feeding on insects in the air, crows digging up or planting acorns or feeding on the ground, or gulls flying in and around the ponds and back toward the ocean. During the month of May the willow trees and other shrubs that line the pond can be full of migrant wablers, videos, and flycatchers. #12 The wooden bridge that takes you around to the fairway on the 12th hole may have Eastern Phoebes, a common flycatcher nesting underneath it. The wetland in front of the tees have been managed to promote vegetation diversity which provides additional habitat for a wide variety of birds, reptiles, and amphibians. #13 The 13th hole carries along one of the man-make ponds used for irrigation. This pond is a likely place to find shorebirds in the spring and fall. Canada Geese through out the year, and migrant ducks in the spring and fall. #17 Widow’s Walk’s "signature hole offers a most spectacular panorama the North River Basin, the ever-changing pastels painted across the nearby salt marshes and multi-treed forests of Audubon’s North River bird sanctuary in North Marshfield. It is a sight to be appreciated for its beauty.